A FOOTBALL fan has recalled the moment 50 years ago today when he watched England lift the World Cup. 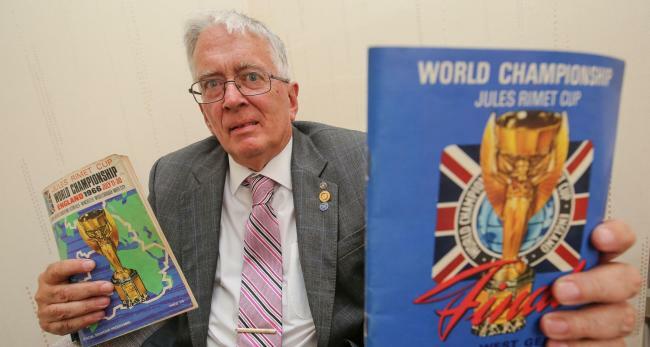 Peter Douch still has the programmes he bought as a 19-year-old as the home side approached their showdown with West Germany at Wembley Stadium. After 30 minutes of extra time, England lifted the World Cup for the only time in its history so far. Mr Douch, of Douch & Small Funeral Directors in Wimborne, said he bought a batch of 10 tickets to matches in London. “In those days you could just buy the tickets very easily,” he said. He saw three of the group stage matches, a quarter final, and the semi-final in which England beat Portugal 2-1. He says he had barely imagined England might find themselves through to the final, let alone lifting the cup. “Brazil were undoubtedly the favourites but they were knocked out along with Bulgaria,” he said. The score that day was 2-2 at full time. England scored twice in extra time, with Geoff Hurst becoming the only player to date to score a hat trick in a World Cup final. From where Mr Douch was sitting, it was hard to tell whether Hurst’s controversial second goal – where the ball was said to have crossed the line after hitting the bar – should have been allowed. “I was behind the goal at the far end when Geoff Hurst scored his goal from the crossbar,” he said. “Being a referee myself, I look at the reaction of the players and the reaction was not too understanding, so I thought it could be a bit dodgy – but fair enough, the linesman judged it and wrote himself into history. “It was a good game and England were a good team. “It was a huge occasion. In many respects I’m more of a cricket fan but I was following Southampton a lot in those days. That was the first year they went up to the old first division and Terry Paine was in the England squad. Born in Wimborne, Mr Douch has supported AFC Bournemouth for much of his life and is a season ticket holder. He says the prospect of seeing the Cherries in the top flight of English football would have seemed more remote than an England World Cup victory. “That was more unlikely – an incredible achievement. “They were more or less out of business once or twice. It’s pretty incredible,” he added.